For the island which the city is on, see South Padre Island. South Padre Island is a resort town in Cameron County, Texas, United States. It is part of the Brownsville–Harlingen Metropolitan Statistical Area. The population was 2,816 at the 2010 census. The town is located on South Padre Island, a barrier island along the Texas Gulf Coast accessible via the Queen Isabella Causeway from the town of Port Isabel. South Padre Island is named after José Nicolás Ballí (Padre Ballí), a Catholic priest and settler. In September 1967, Hurricane Beulah caused extensive damage to much of the town of South Padre Island. On 23 July 2008, Hurricane Dolly made landfall on the island as a category 1 storm, also causing extensive damage to the town. The Bahia Mar Condominium had extensive damage and had to be gutted due to the damage. In September 2008 Hurricane Ike caused moderate damage to the island. In July 2010, the island received heavy rains from Hurricane Alex, but the storm left the island generally unscathed. On December 13, 2009, an unfinished 31-story condominium, known locally as Ocean Tower, was brought down by a controlled implosion. Work had begun in 2006 but construction was halted in 2008 due to uneven settlement. As the problem could not be rectified, the incomplete reinforced concrete structure was demolished. It is believed to be one of the largest buildings to ever be imploded. Subsequent to rebuilding from Hurricane Beulah, the island became a popular spring break destination for college students and a resort destination for families. Many multistory resort hotels and condominiums have been erected along the coastline of the Gulf of Mexico. The Schlitterbahn Beach Waterpark, the second of its kind in Texas, opened in South Padre Island in 2001. South Padre Island is home to many water sport activities, with personal water craft rental, kiteboarding and dolphin watches being the most popular. Other favorites are horseback riding adventures on the beach and ecological tours that explore Padre Island National Seashore. Fishing is also popular. Every year, the Texas International Fishing Tournament is held in late summer, with winnings totaling almost a quarter million dollars. Other fishing tournaments include the Ladies Kingfish Tournament, the Hooters Tournament and the Redfish Rodeo, just to name a few. In March, the island is a popular spring break destination for college students from around the world. The rest of the year it is a popular family resort destination, with July being the most crowded. In January 2011, the island hosted the NBA Development League Showcase at the South Padre Island Convention Centre. The town of South Padre Island is located at the southern end of South Padre Island, with the town limits extending from the northern edge of Isla Blanca Park in the south to the end of development north of Wharf Street in the north, a distance of 6 miles (10 km). 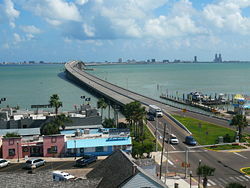 The Queen Isabella Causeway is the only road access to the mainland; it leads 2.5 miles (4.0 km) across Laguna Madre to the city of Port Isabel. Brownsville is 25 miles (40 km) southwest of South Padre Island. According to the United States Census Bureau, the town has a total area of 2.3 square miles (6.0 km2), of which 2.1 square miles (5.5 km2) is land and 0.2 square miles (0.5 km2), or 8.44%, is water. South Padre Island experiences a warm humid subtropical climate (Köppen Cfa), transitioning into a tropical savanna climate. The average high in January is 68 °F (20 °C) and the average low is 52 °F (11 °C). The average high in July is 90 °F (32 °C), and the average low is 77 °F (25 °C). The warm season is long, as average high temperatures are 90–99 °F (32–37 °C), and average low temperatures typically around 77 °F (25 °C). The region experiences relatively high dew point values, around 75 °F (24 °C) in the summer time, resulting in higher relative humidity values from June through September. Rainfall tends to be the highest during the summer and autumn months, usually ranging from 2 to 6 inches of rain each month. September has the highest rainfall, averaging 6.3 inches, followed by October, which averages 4 inches of rain. Due to the island being next to the ocean, temperatures above 100 °F (37.8 °C) are not common. As of the census of 2000, there were 2,422 people, 1,222 households, and 662 families residing in the town. The population density was 1,335.9 people per square mile (516.7/km2). There were 4,685 housing units at an average density of 2,584.1 per square mile (999.4/km2). The racial makeup of the town was 94.59% White, 0.70% African American, 0.45% Native American, 0.21% Asian, 0.04% Pacific Islander, 2.77% from other races, and 1.24% from two or more races. 22.83% of the population is Hispanic or Latino of any race. There were 1,211 households out of which 15.4% had children under the age of 18 living with them, 47.2% were married couples living together, 4.2% had a female householder with no husband present, and 45.3% were non-families. 35.8% of all households were made up of individuals and 7.8% had someone living alone who was 65 years of age or older. The average household size was 2.00 and the average family size was 2.54. In the town, the population was spread out with 12.9% under the age of 18, 6.2% from 18 to 24, 28.2% from 25 to 44, 34.2% from 45 to 64, and 18.4% who were 65 years of age or older. The median age was 47 years. For every 100 females, there were 113.8 males. For every 100 females age 18 and over, there were 115.9 males. The median income for a household in the town was $45,417, and the median income for a family was $53,250. Males had a median income of $39,250 versus $30,028 for females. The per capita income for the town was $31,708. About 10.2% of families and 12.0% of the population were below the poverty line, including 11.1% of those under age 18 and 7.8% of those age 65 or over. Children living in South Padre Island are zoned to schools in Point Isabel Independent School District. Children go to Garriga Elementary School (Grades K–2), Derry Elementary School, (3–5), Port Isabel Junior High School (6–8), and Port Isabel High School (9–12). All of the schools are in Port Isabel. In addition, South Padre Island residents may apply to schools in the South Texas Independent School District. The United States Postal Service operates the South Padre Island Post Office. Coast Guard Station South Padre Island is a United States Coast Guard search and rescue station on South Padre Island. Brownsville/South Padre Island International Airport in Brownsville and Valley International Airport in Harlingen serve the island. South Padre Island is mentioned by Mark Wahlberg's character Cade Yeager in Transformers: Age of Extinction when he is seen first meeting up with his best friend/business partner Lucas (T. J. Miller). South Padre Island is the main setting of Season 4 Episode 20 "Conflicted" of Criminal Minds. Loose interpretations of South Padre Island and neighboring Port Isabel appear in the racing video game The Crew. There are South Padre comic strips, comic books, and a videogame all by Adrian Solis. South Padre Island is Home to The MBM-McCarter Families INC, and headquarters to MBM Corporative INC, since May 2000, where the family has played a big role on the community. This walkway provides access to the beach from a condo. ^ Handbook of Texas Online article for South Padre Island Accessed May 17, 2007. ^ a b "Geographic Identifiers: 2010 Census Summary File 1 (G001): South Padre Island town, Texas". U.S. Census Bureau, American Factfinder. Retrieved July 8, 2015. ^ Handbook of Texas Online biography of José Nicolás Ballí Accessed May 16, 2007. ^ Handbook of Texas Online article on hurricanes in Texas Accessed May 16, 2007. ^ Padre Island's history with tropical systems Accessed May 17, 2007. ^ Ocean Tower implodes into pile of rubble – The Brownsville Herald, December 14, 2009. ^ Background information on Schlitterbahn developments in Texas Accessed May 16, 2007. ^ "Monthly Averages for South Padre Island, TX". weatherbase.com. Retrieved 2017-12-24. ^ Port Isabel ISD Accessed May 16, 2007. ^ South Texas Independent School District Archived 2007-08-29 at Archive.today Accessed May 16, 2007. ^ "Post Office Location – South Padre Island." United States Postal Service. Retrieved on December 28, 2016. ^ U.S. Coast Guard Eighth District Units. Retrieved on December 28, 2016. This page was last edited on 4 March 2019, at 04:33 (UTC).